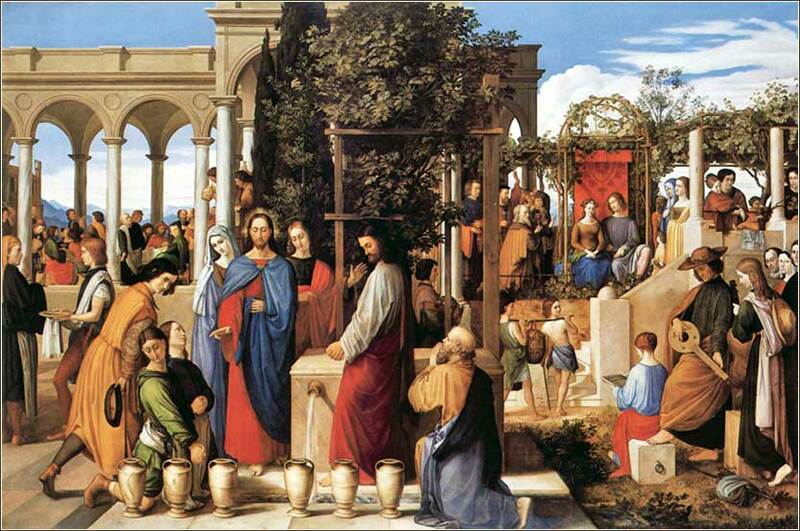 The Wedding at Cana by Julius Schnorr von Carolsfeld, ca. 1820. This page compares five popular Bible translations to the original Greek text of John 2:1-11 (The Wedding at Cana), to assess accuracy of each translation. The five translations are the NASB, KJV, ESV, NIV, and Phillips NT. Included is a verbatim English-language translation, as close as one might come to a true word-for-word translation. Subjective comments about “readability” are also included. The full text of each version is included after the comparison, and at the end, a summary "report card" with grades A to F for each. And on the day the third a wedding occurred in Cana of the Galilee, and was the mother of Jesus there; and were invited also Jesus and the disciples of him to the wedding. We have not written out all the parallel versions of vv. 1-2, because they are nearly identical in all translations. The only liberty is taken in the JB Phillips paraphrase, which reads “two days later” rather than “on the third day”. This improves the sense of chronology a great deal, but loses the symbolism that ties the miracle to the resurrection of Christ, which seems like a reasonable choice for a paraphrase version. 3 And having lacked of wine says the mother of Jesus to him, Wine not they have. 4 Says to her the Jesus, What to me and to you, woman? Not yet has come the hour of me. 3 And when they wanted wine, the mother of Jesus saith unto him, They have no wine.4 Jesus saith unto her, Woman, what have I to do with thee? mine hour is not yet come. The KJV, which is usually quite accurate (to the then-available text), makes an horrendous mistake with “what have I to do with thee?” It not only fails to state the meaning, but makes Mary the object of Jesus' disinterest, rather than the wine. The NIV mistranslates the phrase in multiple aspects. The idiom means, roughly, “why is this our concern?” The subject of the sentence is “it” (impersonal third person), not “Mary”. Jesus does not complain of being involved, as the NIV wording implies; in fact, the text does not state He is “involved” other than Mary having mentioned it to him. The NIV phrase implies a mild rebuke while the original does not. And the expression says and means “not our business” rather than “ not my business”. While dynamic equivalent translations will often sacrifice literal terminology to present the underlying meaning more clearly, the NIV translation obviates possible interpretations that are present and might be intentional. It sounds as if Mary made the decision; one might think it unlikely that she could “involve” Jesus in the matter against His will. Rather, Jesus asks a rhetorical question here; for it actually is His business. In short, the NIV supplies only one meaning and an incorrect one, at that. Phillips' "paraphrase" is, oddly, more accurate to the original text than the NIV's "dynamic equivalent". It actually mimics the Hebrew idiom in understandable English. 2. They have no wine. Mary says “they do not have wine”, not “they have no more wine.” The reason for rewriting this is readily apparent; the following verses speak in terms of the guests being intoxicated on the old, inferior wine, and the translators decided that Mary and Jesus' first exchange should reflect the later narrative. They don't want the reader's brain to have to make the transition from “no wine” in the first verses to “no more wine” in the later ones. Thus we see, immediately, the biggest problem with “dynamic equivalent” translations. The translators make choices for the reader, and they might make the wrong choice, as both the NIV and Phillips do here. John means to convey a stark fact, in the first place: Israel does not have a relationship with God. And even if one disagrees with that interpretation, the reader must be allowed to make or reject the interpretation. 5 Says the mother of him to the servant, Whatever he might say to you you must do.6 Were there stone jars six for the purpose of the purification ritual of the Jews standing, holding each measures two or three. 5 His mother *said to the servants, “Whatever He says to you, do it.” 6 Now there were six stone waterpots set there for the Jewish custom of purification, containing twenty or thirty gallons each. 5 His mother said to the servants, “Do whatever he tells you.” 6 Now there were six stone water jars there for the Jewish rites of purification, each holding twenty or thirty gallons. 5 His mother said to the servants, “Do whatever he tells you.” 6 Nearby stood six stone water jars, the kind used by the Jews for ceremonial washing, each holding from twenty to thirty gallons. So his mother said to the servants, “Mind you do whatever he tells you.” In the room six very large stone water-jars stood on the floor (actually for the Jewish ceremonial cleansing), each holding about twenty gallons. 1. Verse 5. This is practically identical in all translations. Phillips uses a mid-20th-century British idiom, “mind you do”, that would not be read correctly (as fully imperative) by an American today. 2. Six Stone Jars. Everybody gets this right — except the NIV. The point of the reference to Jewish purification ritual is not to describe what the jars looked like, but to identify them as actual ceremonial vessels. Saying that the jars were “the kind used” rather than jars actually used for purification misses the point. How and why this could be mistranslated is inexplicable. The precise capacity of the jars is neither known nor important, so the small differences are irrelevant, except in the KJV, which loses a point by its antiquated language. 7 Says to them Jesus, Fill the waterpots of water. And they filled them as far as the top. 8 And he says to them, Draw now and carry to the feast director; [and] they carried. 7 Jesus said to the servants, “Fill the jars with water.” And they filled them up to the brim. 8 And he said to them, “Now draw some out and take it to the master of the feast.” So they took it. This is accurate in all translations. Translators have a terrible time finding the right term for the person who would, today, be the equivalent of a modern-day wedding coordinator; and actually, nobody is quite sure exactly who he was: a permanent servant or slave who was the steward or butler of the house, an outside master of ceremonies, someone who ran a banquet hall for hire that the family had rented, or something a bit different. 9 And when tasted the feast director the water wine having become, and not he knew from where it is, but the servants knew the having drawn the water, calls the bridegroom the feast supervisor 10 and says to him, Every man first the good wine gives, and when they are intoxicated the inferior; you have kept the good wine until now. 9 When the ruler of the feast had tasted the water that was made wine, and knew not whence it was: (but the servants which drew the water knew;) the governor of the feast called the bridegroom,10 And saith unto him, Every man at the beginning doth set forth good wine; and when men have well drunk, then that which is worse: but thou hast kept the good wine until now. 1. Verse 9. The KJV inexplicably uses “ruler of the feast” for the first reference to the manager and “governor of the feast” for the second, opening the door to confusion about whether two different people are being referenced. Otherwise, all translations convey the intended meaning. 2. Verse 10 - The Good Wine. The NIV really drops the ball here. The adjectives describing the wine are “good”, “inferior”, and “good”. The NIV translates these “choice”, “cheaper”, and “best”, completely missing the point. The cost of the wine is irrelevant (except to the most superficial reading). The old wine, symbolizing the law of Moses, is not distinguished by its low cost, but by its inferiority, i.e. its inability to render adherents righteous before God. The NIV then makes a second mistake, calling the new wine — symbolic of salvation through Christ's blood — the “best” wine. But Christ, being the sole means of salvation, is not the “best” vehicle of salvation; he is the “only” vehicle of salvation. His redemptive power is not capable of degrees of comparison. Using a superlative adjective is erroneous — it is not a case where the old covenant was good at saving men's souls but the new covenant was best! In trying to spice up the surface narrative, the NIV erases the symbolic meaning. For a second time in this passage, the Phillips paraphrase, which nominally takes the greatest liberty with the text, stays more literal than the NIV, at a point where the exact term is important. 11 This he did the beginning of the signs Jesus in Cana in Galilee and revealed the glory of him, and believed in him the disciples of him. Jesus gave this, the first of his signs, at Cana in Galilee. He demonstrated his power and his disciples believed in him. 1. Signs. All translations say “signs” rather than “miracles” except the KJV. “Miracles” is technically a correct translation, but the word literally means “signs” and this term is more sensitive to John's theological purposes. 2. Beginning. John's original text tells us that the miracle at Cana was the “beginning” of Jesus' signs. There is no reason for the ESV, NIV, or Phillips to change this to “first”, except that a translator thinks it sounds better. Yes, it was the first of His signs, but that is not what John wrote and not what he meant. “Beginning” has a special significance in John. The word he chose to use here is the same as the second word of 1:1 (literally, “In beginning was the word”). Mistranslating “beginning of signs” as “first sign” loses the resonance with the first words of John's Gospel. At a more mundane level, John is saying that this is the starting point of Jesus' revelation of His divinity. Phillips may be excused, but the ESV and NIV would be hard-pressed to defend the change. 2 [And] were invited also the Jesus and the disciples of him into the wedding. 3 And having lacked of wine says the mother of the Jesus to him, Wine not they have. 4 Says to her the Jesus, What to me and to you, woman? Not yet has come the hour of me. 5 Says the mother of him to the servant, Whatever he might say to you you must do. 6 And were there stone jars six for the purpose of the purification ritual of the Jews standing, holding each measures two or three. 7 Says to them the Jesus, Fill the waterpots of water. And they filled them as far as the top. 8 And he says to them, Draw now and carry to the feast director; and they carried. 10 and says to him, Every man first the good wine gives, and when they are intoxicated the inferior; you have kept the good wine until now. I'm in a poor position to evaluate my own translation! I have tried to give the closest approximation possible to an actual word-for-word translation. Whatever problems there are with it, it is surely competent for the purposes used here, i.e. to show where a less literal translation has clearly and significantly varied from the Greek text. 1 On the third day there was a wedding in Cana of Galilee, and the mother of Jesus was there; 2 and both Jesus and His disciples were invited to the wedding. 6 Now there were six stone waterpots set there for the Jewish custom of purification, containing [b]twenty or thirty gallons each. 7 Jesus *said to them, “Fill the waterpots with water.” So they filled them up to the brim. 8 And He *said to them, “Draw some out now and take it to the [c]headwaiter.” So they took it to him. There is not much to criticize in the NASB's translation of this passage, other than that it is a bit awkward to read; it sacrifices some narrative flow in the interest of accuracy. The translation is the most accurate of the published versions compared here and highly satisfactory for close Bible study of John 2:1-11. And the third day there was a marriage in Cana of Galilee; and the mother of Jesus was there: 2 And both Jesus was called, and his disciples, to the marriage. 3 And when they wanted wine, the mother of Jesus saith unto him, They have no wine.4 Jesus saith unto her, Woman, what have I to do with thee? mine hour is not yet come.5 His mother saith unto the servants, Whatsoever he saith unto you, do it. 6 And there were set there six waterpots of stone, after the manner of the purifying of the Jews, containing two or three firkins apiece. 7 Jesus saith unto them, Fill the waterpots with water. And they filled them up to the brim. 8 And he saith unto them, Draw out now, and bear unto the governor of the feast. And they bare it. The KJV was generally accurate when it was translated, although we note a major exception in this passage. The difficulty of reading 17th century English, the primary objection of most people who don't like the KJV, is actually not a problem treated here. For the serious student, there are more pressing issues: First, some of the terminology is be so dated that, at times, a word used in the KJV actually means something different today than it did then, misleading the reader; and second, the text from which it is taken is significantly less authentic to the original Greek text than later translations. The ESV, in this passage, delivers exactly what it promises: a more readable text than the NASB or KJV with only small discrepancies in accuracy. It would seem, from this passage, to be a good compromise for someone who wants a Bible that is a little easier to read, but has enough accuracy to the original text to be useful for study. On the third day a wedding took place at Cana in Galilee. Jesus’ mother was there, 2 and Jesus and his disciples had also been invited to the wedding. In this passage, the NIV repeatedly and significantly changes the meaning of the actual (Greek) Bible. The translation choices are unfathomable. I included it here because it is so popular, but, if this passage is any indication, its popularity would seem to be a triumph of marketing over merit. Two days later there was a wedding in the Galilean village of Cana. 6-11 In the room six very large stone water-jars stood on the floor (actually for the Jewish ceremonial cleansing), each holding about twenty gallons. Jesus gave instructions for these jars to be filled with water, and the servants filled them to the brim. Then he said to them, “Now draw some water out and take it to the master of ceremonies”, which they did. When this man tasted the water, which had now become wine, without knowing where it came from (though naturally the servants who had drawn the water knew), he called out to the bridegroom and said to him, “Everybody I know puts his good wine on first and then when men have had plenty to drink, he brings out the poor stuff. But you have kept back your good wine till now!” Jesus gave this, the first of his signs, at Cana in Galilee. He demonstrated his power and his disciples believed in him. Phillips was a brilliant paraphrase when it was done, and is still worth having if you want to read a long passage. It is especially good for reading the notoriously difficult parts of Paul's epistles. The flow and availability of ideas in Phillips' translation have no parallel; it is in this sense the best New Testament available. It is not meant for study but, in the passage we considered here, it is about as accurate as the ESV and considerably more so than the NIV! The problems with Phillips are that it is already becoming dated and, for American readers, uses some language idiomatic to British English. 11 This act in Cana of Galilee was the first sign Jesus gave, the first glimpse of his glory. And his disciples believed in him. The Message is unlike any other Bible translation; it is filled with slang and sometimes radically paraphrases the text. It is a paraphrase, and the translator (Eugene Peterson) explicitly warned, in the introduction, that the reader should not rely upon it for study. But it is fun to read, is often amusing, and frequently, by giving such a radical change in perspective, can actually illuminate aspects of a text. It will be irritating to many people and, even for those who enjoy it, it should be used only for a second version. will range from A to F, depending on the reader's needs and interests.